The celebrated author of Cleikum Cracks John A. Anderson was born in Walkerburn in 1874. He attended Walkerburn School until his family moved to Innerleithen when he was 10 where he completed his formal education at Leithenside School. In common with most of his contemporaries his working life began in “The mill”. A member of Craigside United Presbyterian Church, he found relief from the hard toil and monotony by joining a local debating society and, at the age of 14, he became the youngest member of the Innerleithen Alpine Club. These activities stimulated his life-long interest in the literature and history of Tweeddale and the Scottish Borders, subjects about which he was to become extremely knowledgeable. In 1901 he married Janet Stewart, a daughter of sawmiller William Stewart, whose term as Provost of Innerleithen had ended the previous year. He changed his employment from mill worker to that of sales representative for a typewriter manufacturer. 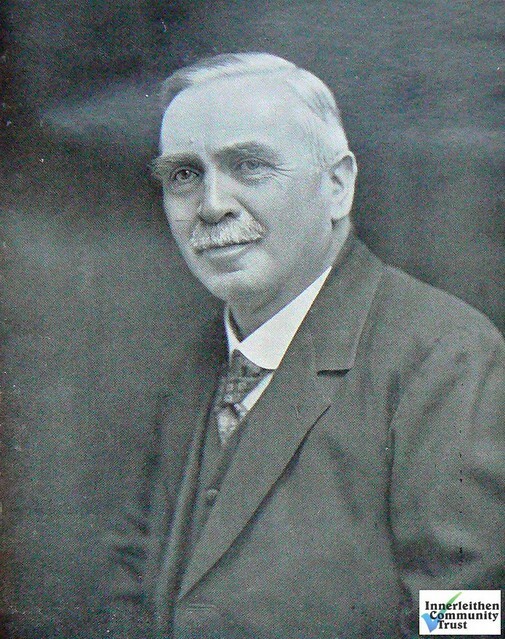 His other career as a columnist began in the 1890s with regular contributions to The Peeblesshire News, The St. Ronan’s Standard and The Peebles News. Following the amalgamation of the titles, The Cleikum by J.A.A. appeared every week in The Peeblesshire News until his death in 1932. Erudite and articulate, he wrote on a wide range of topics and places and particularly about Innerleithen, Walkerburn and Traquair. His love and knowledge of his native parish made him an automatic member of a group which was to devise and inaugurate the Cleikum Ceremonies in 1901. After spells in Peebles, where he ran a bookshop in the High Street, and Glasgow, he moved to Birmingham to take up a post as a “rep” for Valentine’s of Dundee. A year later in 1912 he became the company representative for the South and moved to Harrow just outside London where he would spend the remainder of his years. He soon became involved with various Scottish societies, in particular the Caledonian Club and the Burns Club of London. A regular and popular lecturer at the latter he became its President in 1930. He was also one of the founding members of the Harrow and District Caledonian Society which thrives to this day and has as one of its members his daughter, Mrs Olive Russell. Following an illness John A. Anderson died on 16th June 1932. For all that he spent much of his 58 years “in exile” he never forgot his roots and not once did he fail to send a weekly contribution to The Peeblesshire News. A selection of these articles made by his daughter was published in 1933 by The Border Telegraph in a book also entitled The Cleikum. Sadly, this has been out of print for many years and copies are now scarce. A sequel, At the Sign of the Cleikum, comprising more of J.A.A.’s articles selected and edited by Mrs Russell, was published in paperback by Bordersprint Ltd of Selkirk in 1996.